FXpansion are perhaps best known for virtual instruments such as their massive BFD series of virtual drum kits, but over the last couple of years, they've also released quite a few plug-in effects and processors. 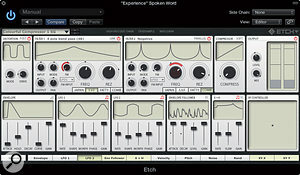 The three under review here are, respectively, a delay, a filter and a distortion effect, and all three use FXpansion's Transmod Modulation Matrix, also deployed in the company's Synth Squad and Tremor plug-ins. See the box for details of how this works. All three plug-ins are 64-bit compatible and are available in VST, AU and RTAS plug-in formats, supporting Mac OS 10.6.2 and Windows 7 — there's no AAX support at the time of writing. Authorisation takes place online, and all three plug-ins have a free demo period if you'd like to have a play before you buy — always a welcome option. 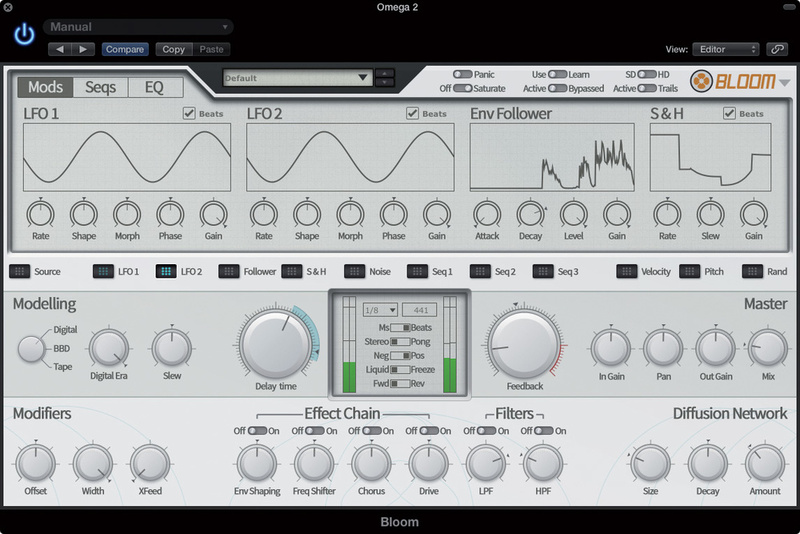 As well as a three-band equaliser, Bloom's EQ page allows you to configure the order of the various effects blocks. 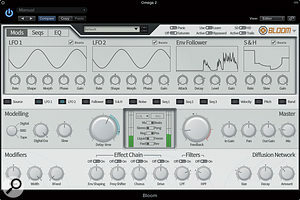 Bloom is, in essence, a delay effect, though of course you wouldn't expect a delay plug-in from FXpansion to be anything close to normal, and thanks to Transmod it isn't. The core of the plug-in is a stereo delay line that can be switched to provide a digital, analogue (CCD) or tape-like character. Additional effects comprise overdrive, filtering, saturation, dynamics, frequency shifting and chorus; the placement of these effects in the audio chain can be adjusted via the EQ/Routing page tab, so you can opt to process only the feedback path or the overall delay sound. A pair of EQ blocks are available, one in the effect chain and the other at the delay output. A reverb-style diffusion module can be placed in one of three positions in the audio chain, and as well as the LFOs, envelope follower and Sample & Hold module, the Transmod modulation sources include a set of step sequencers. The layout of this plug-in looks somewhat synth-like, with waveform displays at the top of the main screen for the two Transmod LFOs, the envelope follower and the Sample & Hold section. Three tabbed pages get you into the Modulators, Sequencers and EQ/Routing page: the latter is used both to access the controls for the two sets of equalisers and to change the signal-path position of the Diffusion section and the effects block. When modulation sources are running, the pointers on the target controls move to show you what is going on. Even the sequencing side of things is more comprehensive than it might appear, as there are actually three separate step sequencers that can be routed to the delay time, the Freeze control (which loops whatever is in the buffer) and the Reverse function, or be routed to any other parameters using Transmod. The sequencers lock to the song tempo, but each can be set to different note divisions. The Transmod section occupies the top half of the Bloom interface. In this case, LFO2 is set to modulate the delay time, but only over a limited range. At the top of the screen are some switch-type controls, the first being Panic — a means of clearing the delay buffers when things get out of control. Saturate engages a level-dependent soft distortion algorithm. The Active/Trails switch is an alternative to the Bypass control which allows any currently active delays to expire naturally rather than being cut off in their prime. SD/HD switching offers a choice between high-resolution processing at the expense of heavier CPU load or a lighter version that may exhibit some aliasing artifacts on some effect settings. As you can see, there's quite a lot of depth to this plug-in, though once you've read the manual most things are pretty intuitive. As you might expect, there's a decent selection of categorised presets to give you some idea of what Bloom can do and they're a good place to start your explorations. It is possible to conjure up fairly authentic vintage tape echo sounds by using the modulation sections very subtly to impose some random flutter and LFO-driven wow, and a little dirt and filtering in the feedback chain to add to the authenticity — but then, there are lots of plug-ins that will do that for you. Things get far more interesting when the various sections are combined and the parameters modulated, where the sounds on tap range from beautifully lush and swirly to downright nasty and glitchy. For example, short delays with modulated feedback level and pitch-shift produce effects reminiscent of granular synthesis, while some patches even use a combination of excessive feedback and sequencer control to play repeating soundscapes with no user input at all. From industrial and grotesque to relaxing and chilled, it's all there, but be prepared to put in a little time to explore all the possibilities. If you just need a delay that will play nicely and give you some extra shimmery sounds, then there are many viable alternatives, such as the excellent effects section of NI's Guitar Rig. 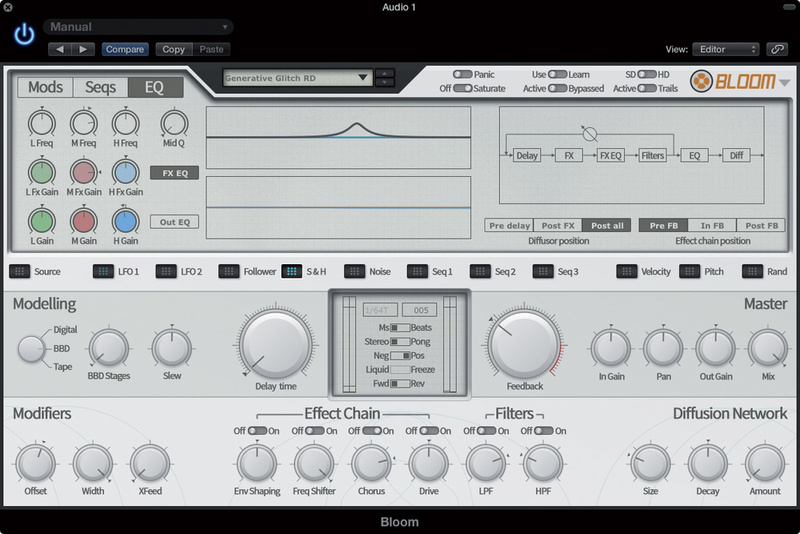 However, when you need to conjure up more aggressive or off-the-wall effects, Bloom is going to be a hard act to follow. 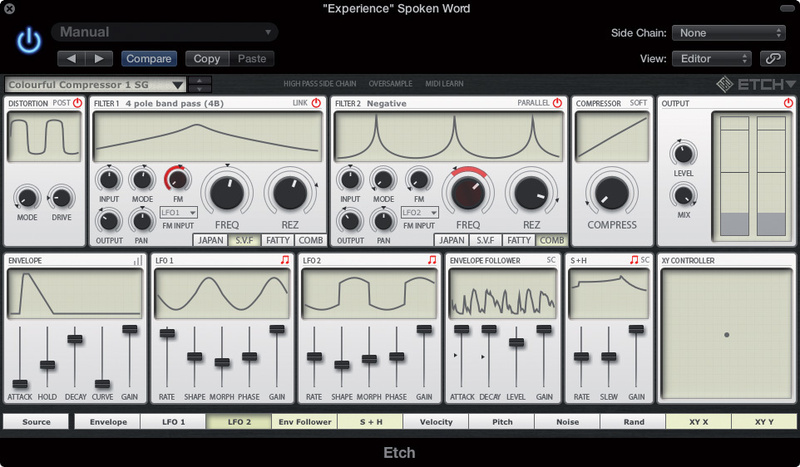 Etch applies FXpansion's Transmod engine to a pair of resonant synth-style filters. Each of these can be switched between four modelled circuit types and various shapes including a comb filter. The implementation of Transmod in this case offers an ADSR envelope generator in addition to the LFOs, envelope follower and Sample & Hold section. Metering is supplied in the output section along with Level and Mix controls and, again, an oversampling mode allows for cleaner processing at the cost of more CPU overhead. Each of Etch's two filters offers four different algorithms as well as a choice of shapes. Distortion can be applied prior to the filters, with six selectable flavours available. A hard/soft adjustable compressor stage adds to the interest, and there's also a means of applying frequency modulation to the filter cutoff to create some very ring-modulator-like noises. Etch has a second set of audio inputs that can be selected as the FM source for either of the filters, as an audio source for the envelope follower or as an audio source for the Sample & Hold section. 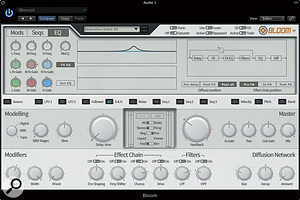 A high-pass filter can also be switched in to the side-chain filter. Each filter has input and output level controls and a pan control, so dramatic stereo filtering effects are no problem. Further control comes courtesy of an X/Y pad which acts as a kind of virtual joystick, and as with Bloom, you can also trigger envelopes over MIDI where the host DAW permits. Because Transmod allows any control source to be routed to any variable parameter, you can do odd things like have the filter resonance change with the incoming signal's envelope while also feeding it random values from the Sample & Hold section. Having distortion available means you can generate more harmonics for the filters to chew on while the post-filter compressor helps keep resonant peaks under control. The effects on offer range from shimmery sweeps to 'gargling from hell', and again, a selection of presets is available to show off the scope of this plug-in. It goes way beyond what most filters offer and has applications outside the obvious dance music contexts, though my guess is that that's where it will find the most fans. 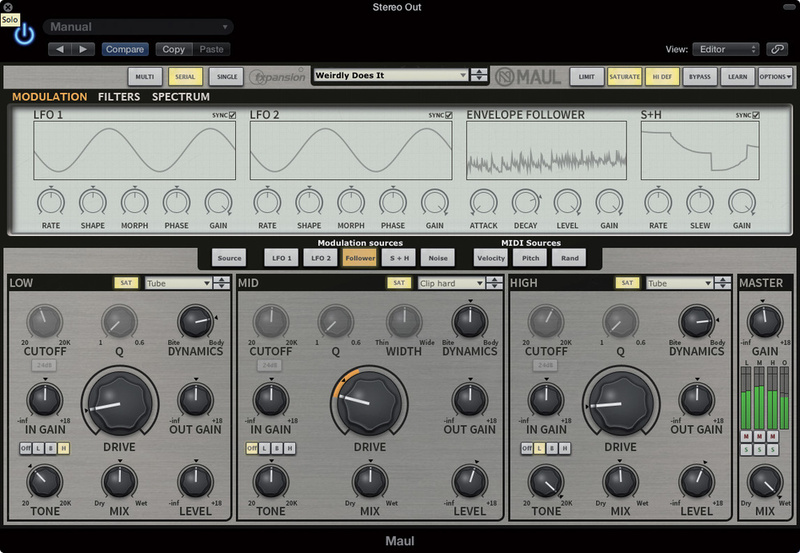 Maul is a three-band distortion processor where each band can be set independently to one of 32 different styles of distortion. Some are based on models of real devices such as op-amps, diodes and valves, but there are also bit-crushers and waveshapers.Transmod can turn the predictable behaviour of the drive sections into something seriously deranged, but there's enough range of control to allow some very subtle treatments too, such as very gentle tube overdrive to add weight when processing a drum bus or fattening a bass line. A Saturation button brings in an additional saturation function, selectable per band, which interacts with the existing drive and level settings, though I found that in most cases its effect was very subtle. 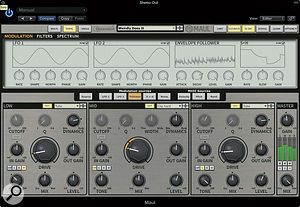 Maul can be used either as a single-band or a multi-band distortion processor. In Multi mode, the input signal is divided into three frequency bands using low-pass, band-pass and high-pass filters with adjustable resonance, which can be switched between 12 and 24 dB per octave. The other two modes are Serial mode, in which all three distortion algorithms are applied successively to the full-band input, and Single mode, which disables the upper and lower bands. Tone controls within each band are provided, in addition to post-distortion filters which can be set to low-pass, high-pass, band-pass or off. There are also separate input and output level controls for each band, as well as a large Drive knob that switches to adjusting frequency if you select Ring Modulation as your distortion option. Further flexibility comes from the Dynamics control, again one for each band, which works not unlike a Transient Designer in that it allows the attacks to be sharpened or the release phase of the sound to be filled out — though not both at the same time. And if overall parallel processing is your thing, no problem: there's a master wet/dry mix control as well as one for each band so that you can add just a hint of dirty sound to your unprocessed sound. This master section also includes master level controls plus mute and solo switches for each band. Like the other two plug-ins, Maul has uses that go beyond the obvious. Adding a modest amount of distortion just to the highs and then adjusting the Mix control creates an effect not unlike an Aphex Aural Exciter, giving the impression of more top end but without the distortion being obvious. Add distortion to the lows, meanwhile, and with a little filter adjustment the bass end warms up as though processed via an analogue tape machine or valve amp. More creatively, you can do things like key the amount of distortion to the input level so that the attacks gets dirtied up but the notes still fade away cleanly. At the other end of the scale, you can engage the bit-crushers or ring modulators and get the sound of somebody demolishing a corrugated iron shed with a chainsaw, all in a way that twists and turns according to the input signal or any of the modulators. I can see Maul appealing to anyone doing any of the more brutal styles of electronic music as it is a great way to reshape samples, especially bass sounds, but as long as you keep away from its more extreme capabilities, it also makes a great bus sweetening tool or guitar re-processor. It can also get you close to that '21st Century Schizoid Man' vocal sound, should you wish to. The more I used Maul, the more applications I found for it: although it might look at first glance like an audio destruction tool, it's actually a really cool finessing tool too, and over the course of this review it came out as my favourite of the three. I can see this getting a lot of use in future Mix Rescues! With all three of these plug-ins, FXpansion have taken a standard starting point and fed it steroids. All three of these plug-ins are versatile and inspire creativity, though with my old-school hat on, I think that Maul may actually be the most useful in a conventional mix situation. Though it can take some time to figure out what destination to modulate with what source, Transmod is a great concept to take from the synth world and use with effects, not least because the designers have made it very easy to use. Other plug-in manufacturers who make delay, filter and distortion plug-ins that go beyond the conventional include Ohm Force, FabFilter, Native Instruments and Sound Toys, among many others. FXpansion's Transmod Modulation Matrix is featured in all three of the plug-ins under review here, though it looks different in each case. The matrix allows the user to modulate pretty much any continuously variable parameters within the relevant effect section from a combination of any of the modulation sources, with the ability to specify the modulation range controlled by each source. Buttons arranged in a horizontal row select each of the modulation sources; then you simply adjust the edge of the target knob so that the shaded area appearing around the edge of the control corresponds to the range of the modulation desired. The start point for the modulation is determined by the actual pointer setting of the control. Modulation sources available in the TMM comprise a pair of LFOs with adjustable wave shapes, an envelope follower, a Sample & Hold module, and in the case of Bloom, a set of three step sequencers. In addition to the main modulation sections, there's also the option to modulate using incoming MIDI Note messages in those DAWs that allow plug-ins to receive MIDI. A separate noise modulation source, also part of the Transmod setup, is available to produce a string of random values for use as a modulation source. It is also possible to use external MIDI CC messages to adjust parameter settings (this adjusts the initial setting in the case the parameter is already being modulated) and to adjust Transmod modulation depths. A MIDI Learn mode is included to make assigning controllers as easy as possible. You can also automate parameters using the DAW's usual automation protocol, though this doesn't seem to apply to Etch's X/Y pad. Excellent range of sounds, from magical to maniacal. The Transmod matrix makes it relatively easy to create effects that interact with the input and other controllers. No cons other than their sophistication means that learning how to use these plug-ins to their best advantage may take a little time. These are all fantastically versatile plug-ins that allow synth-like control over what might otherwise be very 'normal' effects, but once past the presets you'll have to put in just a little work to get the best results.